As my second-baby bump grew and I pushed my toddler to the swings, I was adamant I wasn't going to need a second buggy. I'd spot huffing, puffing mamas pushing hefty multiple-kid-cart-about-ers to the playground. And I'd smugly think about how my back/shoulders must have become SO strong by now after carrying my toddler around, that I'd spend all my time sling-ing the newborn, and staying nippy with my two-year-old in a light stroller like the City Tour or light XSS. And then along came tiniest man, and I realised I was wrong. There's a limit, I now concede, to how much you can carry a newborn in the sling. First, it makes them sleep all the time - which sounds great, until night-time beckons and your babe's been sling-snoozing all day long. Second, mine was born in May: it was soon very hot and I worried about sun protection. Plus we both got super sweaty when walking for more than ten minutes.. So it was time for some swift double buggy research. The first choice: side by side or double decker? I always feel bad for the underlying babe, with a view like the hold of a jumbo jet, so wanted side-by-side. In that range, though, most doubles seem to be aimed at older tots or twins - I still wanted my newborn to be parent-facing. I didn't want anything too huge or heavy. And so after a ton of research I picked Cosatto's Duo To & Fro. 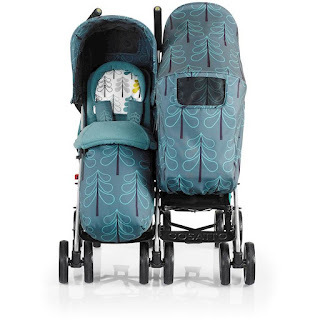 I already loved the brand - I have its Giggle 2 travel system as my main buggy, and it's colourful, reliable, great quality and is coping well with its second child! But the best thing about the Duo is it's perfect for when you've two kids at a different age and different stage - one seat can be parent-facing, one world-facing, or both can be either; the seats lie flat so work from birth, and it comes with all the 'extras' that other brands charge a bomb for - like rain covers, muffs, and even coffee cup holders.. which you definitely need with a second baby. Now we've been rolling around with these wheels for just over a month, here's our verdict in full. 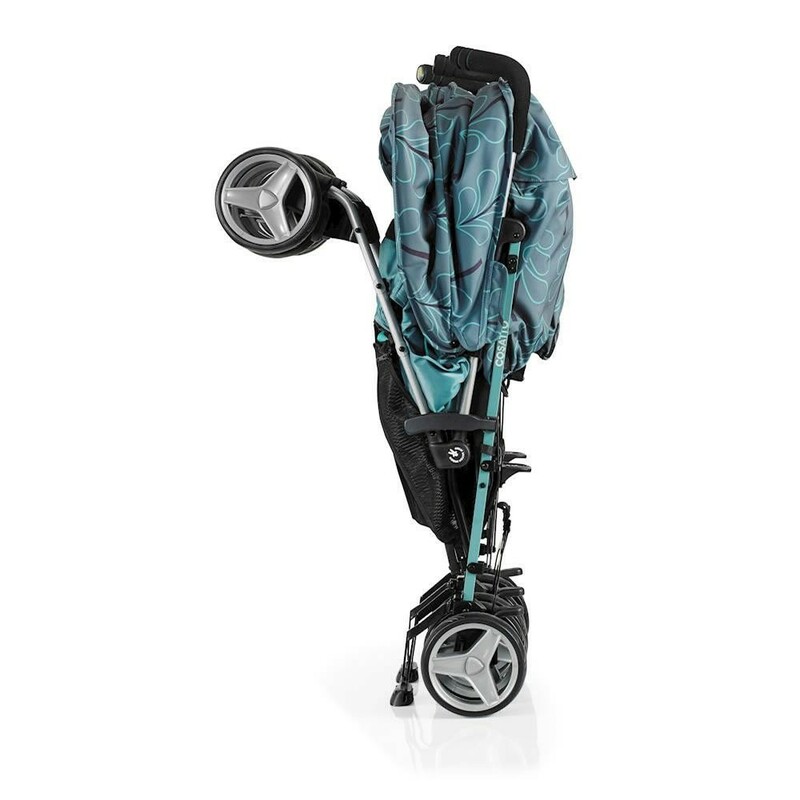 * The To & Fro Duo has an umbrella fold: this means you can whiz open the buggy speedily, which is seriously useful when you've two tots waiting for their walk / shopping / playground trip etc. * It's freestanding: the folded buggy isn't small so if you've a small home or no spare cupboards etc, this buggy is going to be out on show - it's currently in our lounge.. What's good, though, is that it stands up on its own, so no need to prop it up against a wall where it'd inevitably be tripped over by a toddler.. Also, as per Cosatto's speciality, it comes in lovely prints (we went for 'Fjord') so at least it looks decent in the lounge! * It's nippy. As double buggies go, this one is easy to wheel - even ulike an assault course). It's also pretty nimble and not too wide.. you can find all the dimensions here but as a basic guide, I've been to both local shops, restaurants and a shopping centre and not yet found a doorway we didn't fit into (albeit sometimes with a bit of jiggling). 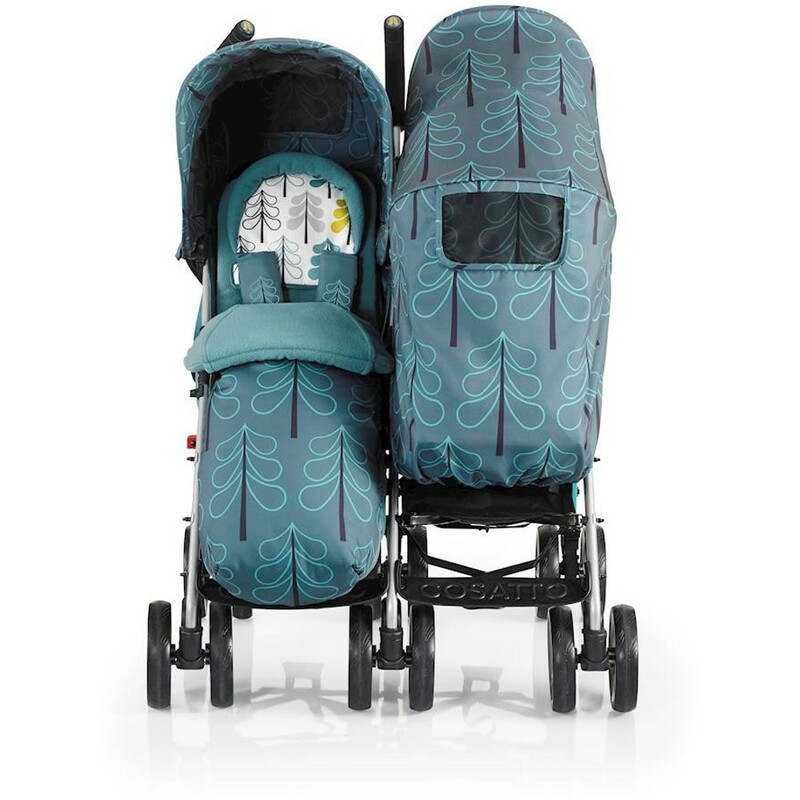 * The sun coverage: the To & Fro Duo comes with really flexible, SPF 50 hoods, which can go either way (for both parent and world-facing rides) but are also super long so however the sun is shining, your babes are likely to be shaded. * It's long-lasting: the fact that you can switch the direction of the seats means the buggy can stick with you for a long time. * It's "comfy" - according to my two-year-old. And he's fussy! The same looks true for the parent-facing chair when it's flat (for a baby) too: they're strapped in securely with a really soft head support and warm cosy toes muff. * It has a four-year guarantee - and super-helpful customer service phone line where they answer the phone quickly and know the answers to even the most esoteric buggy Qs. But what could the To & Fro Duo do better? 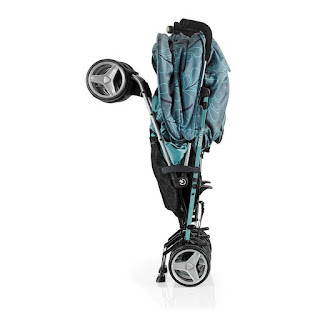 * Despite being one of the lightest double buggies on the market, it's still blimmin heavy - 15kg when empty. Add a toddler and newborn and you're easily pushing over 30kg. Which mainly isn't a problem to push, but IS very hefty to hoik into the car boot or up stairs to your doorway. * If you want one seat parent-facing, it does take a bit more fiddling with knobs to get the buggy ready from folded- enough to be stressful if you've a crying babe and just want to speedily leave the house. * I found the hood keeps sliding back when the buggy hits an obstacle like a bumpy kerb - which can leave the buggy dweller in the sun. If you've a second baby on the way, and are looking for a double buggy, good luck! Let me know if you've any more Qs about Cosatto's To & Fro Duo and I'll be happy to answer. Thanks for this was very helpful. Saying'abit of fiddling' when on swat is parent facing, does this mean you can't keep one parent facing when folding? They both have to be outward facing to fold it? Thanks for reading. Yep you have to flip the seat up into out facing to fold it. Just two levers but one more thing to do. Great review! 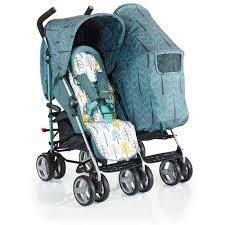 Just wondering if you can attach the Cosatto car seat to it? No sadly not, doesn’t clip on. 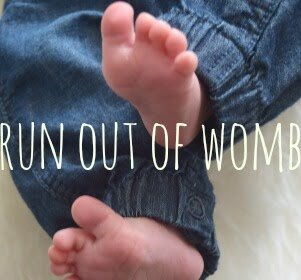 © run out of womb. All rights reserved.